called Fort St. Nicholas was build near here by Russian fur traders . . . In 1869 the U.S. Army established Fort Kenai (Kenay)." 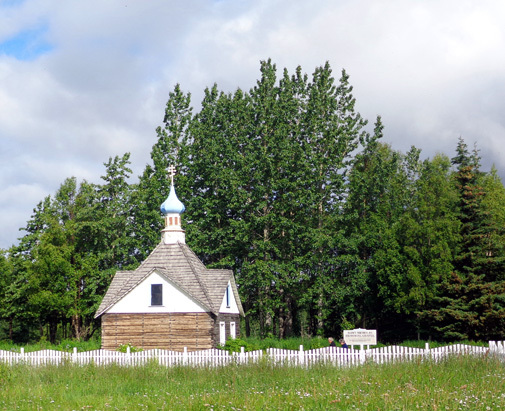 Kenai is a much older town than Soldotna and we were interested in seeing its historic buildings, particularly the picturesque blue onion-domed Russian Orthodox church. 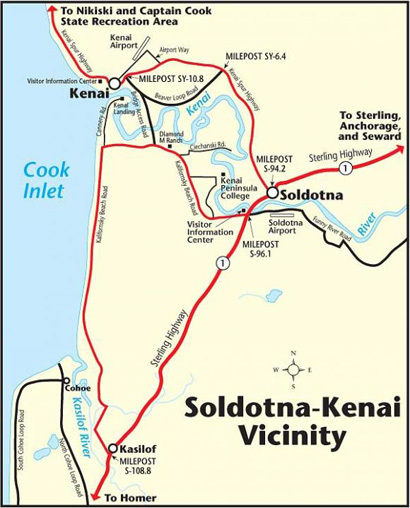 Kenai is also larger than Soldotna, with a year-round population of about 7,000 people. 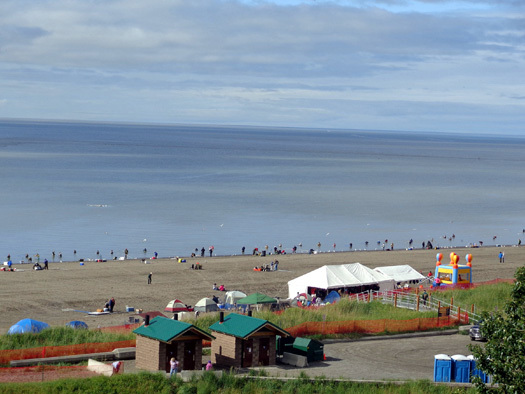 As with most other areas in Alaska, the population swells considerably in the summer. It's even more crowded now during the two-week dipnet red salmon fishing season for state residents. The outlet of the Kenai River is one of the busiest dipnetting sites in Alaska. 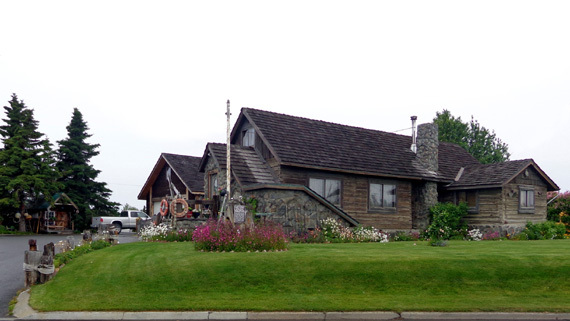 This entry focuses on the historic buildings in Old Town Kenai and the dipnet fishing frenzy we observed. As you can see, Soldotna is located several miles upstream on the Kenai River. 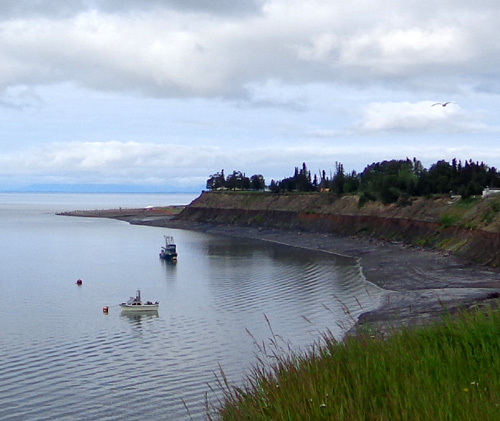 Kenai is situated on a bluff right at its mouth at Cook Inlet. Even if you aren't into fishing there is a lot to see and do in Kenai. There are sandy beaches, estuaries full of wildlife, marvelous views (on a clear day) of mountain ranges and five active volcanoes across the water, colorful city parks full of flowers, countless recreational opportunities, and history galore. Business appears to be thriving here with not only the sport fishing industry fueling the economy but also a robust commercial fishing industry, extensive oil and natural gas production nearby, and tourists galore. 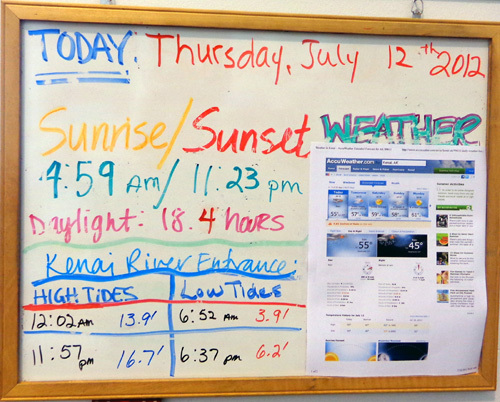 Yesterday afternoon we drove about eight miles north of Soldotna on the Kenai Spur Highway to Kenai for a quick initial visit to gather more information that we could absorb before returning for a longer visit today. You can tell which photos I took yesterday because the sky is overcast. Today's are more blue. We were in a hurry so I didn't pay the fee ($3 for folks over 55, $5 for young 'uns) to enter the museum part of the building and/or participate in any ongoing activities. We're kind of museumed-out at this point so we'll save that for another trip to Alaska. It's reported to be well worth the cost of entry, however. Old Town Kenai is close to the visitor center. Yesterday we got a map for the walking tour but since it was raining we drove through as much of it as we could instead of walking. Some of Old Town is pedestrian only. Several of the buildings are listed on the National Historic Landmark register. 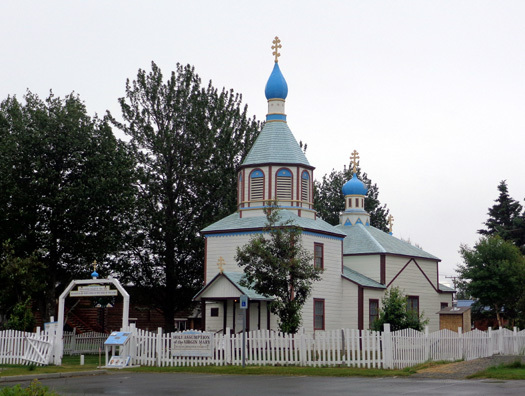 Holy Assumption was built in 1894 and is one of the oldest remaining Russian Orthodox churches in Alaska. The building is undergoing some repairs but services are held regularly in it. 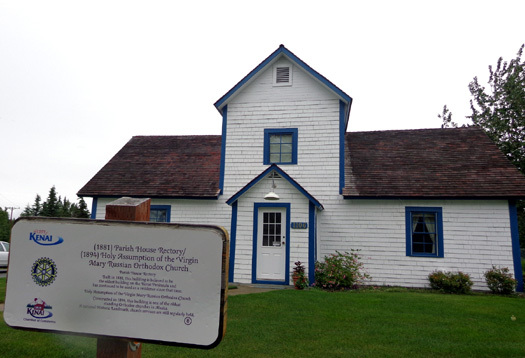 The original church was founded in 1846 by Father Nicholai, a Russian monk, and was located inside the Russian trading post of Fort St. Nicholas closer to the bluff overlooking Cook Inlet. 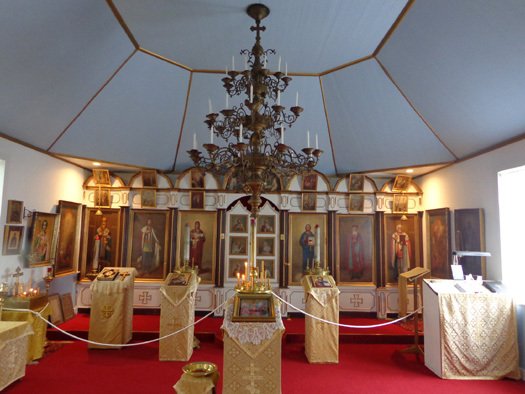 You'll note in this photo and others I'll be showing you of Russian Orthodox churches that there are no pews. One of the unique practices of this faith is that the congregation stands during the entire worship service. The sign says that it was built in 1881 and has been used as a residence ever since that time. 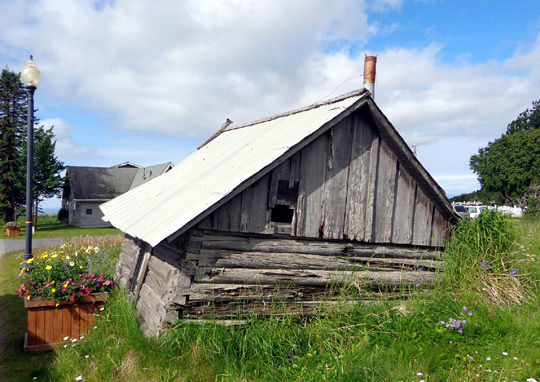 It is believed to be the oldest building on the Kenai Peninsula. It was last renovated in 1999 and continues to be used by priests who are serving the church. The construction is rather unusual. Hand-hewn logs are joined with square-notched corners and covered with wood shingles painted in the original colors. There was no sign on it so I don't know its significance. Fort Kenai AKA Kenay is mentioned in the quote at the top of this entry. 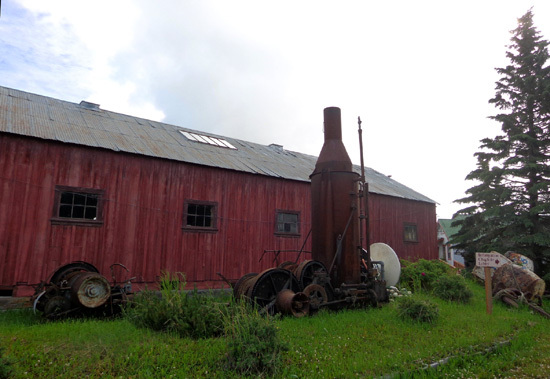 Built in 1868, it was the first U.S. military installation in the area. Over 100 soldiers manned the fort for about 18 months to protect the American citizens who lived nearby. The house with its nicely landscaped yard is located between the Russian Orthodox church and the memorial chapel. It has been converted into Veronica's Coffee House now and looks like an appealing place for lunch or dinner. The house is constructed of square logs and stones, with a cedar shake roof. Various kinds of buoys, nets, oars, whale bones, and other fishing-themed items decorate the yard. I'd love to see inside! SPEAKING OF FISHING . . . I'll shift gears now and talk a little bit about the commercial, sport, and subsistence fishing for which Kenai is renowned. We didn't have time to see much of the town of Kenai yesterday and in the rain it wasn't a great day to play tourist or take photos. This morning we headed back to Kenai but took a different route from our campground in Kasilof. From the Sterling Hwy. 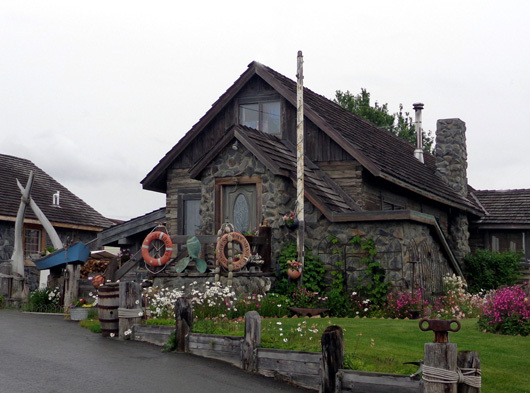 we turned north on the Kalifornsky (K-Beach) Road and drove along Cook Inlet for about 14 miles to the old salmon cannery at Kenai Landing, on the south side of the Kenai River across from the town of Kenai. You can see K-Beach Road and Kenai Landing on the map at the top of this entry. When the cannery was being built, remains of several old structures, seal oil lamps, and stone utensils were found that date back to the Stone Age! 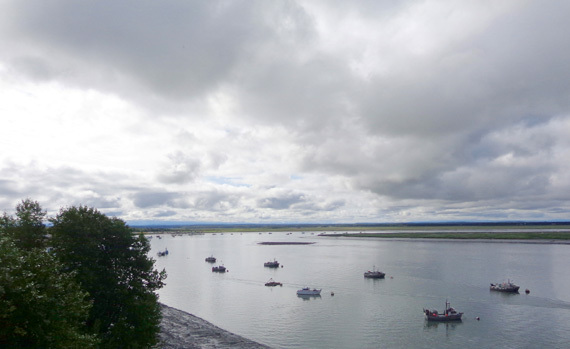 Now the salmon cannery is in the history books, too, and this prime site at the mouth of the Kenai River has been renovated into a seasonal resort with a hotel, shops, restaurants, campground, and fishing venues. 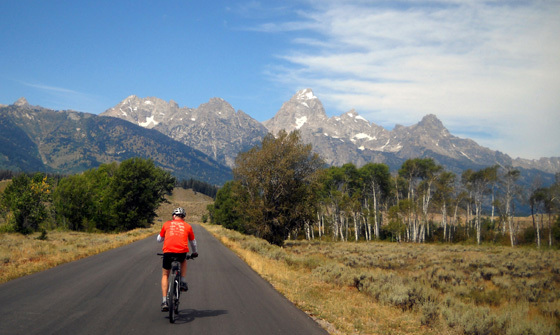 We didn�t go into any of the shops but we eye-balled the RV Park and are glad we didn�t stay there. 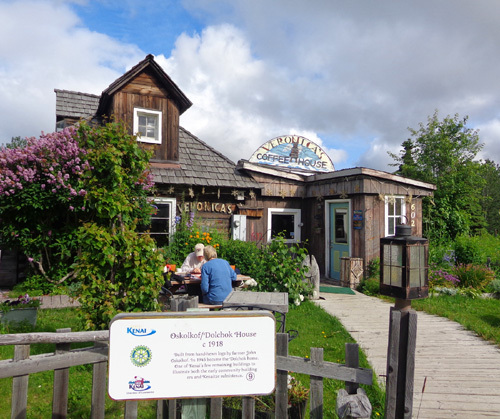 In fact, we haven�t seen any campground in or near Soldotna or Kenai that we like as much as the one we chose -- the Kasilof RV Park -- based on the description in Mike and Terri Churchs� Alaska Camping book. 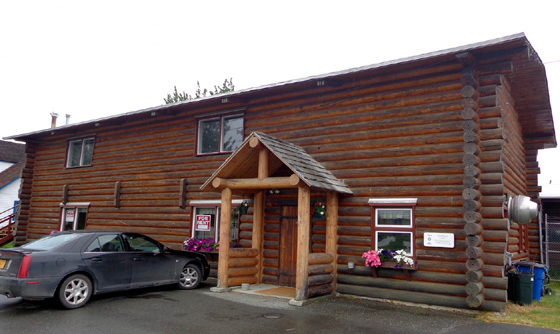 The Kasilof RV Park�s own website is attractive, too, and the photos and descriptions are more true-to-life than any of the others we checked. 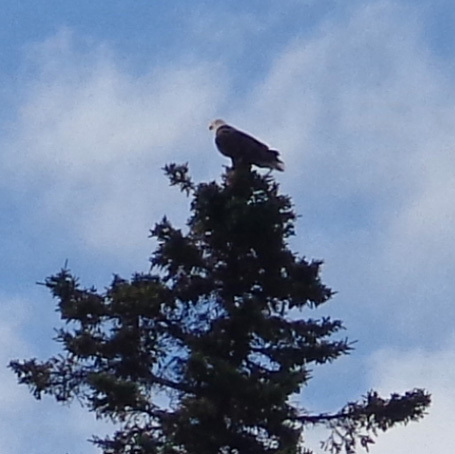 Bald eagle 'way high up in a pine tree in a park in Kenai; eagles like salmon, too! 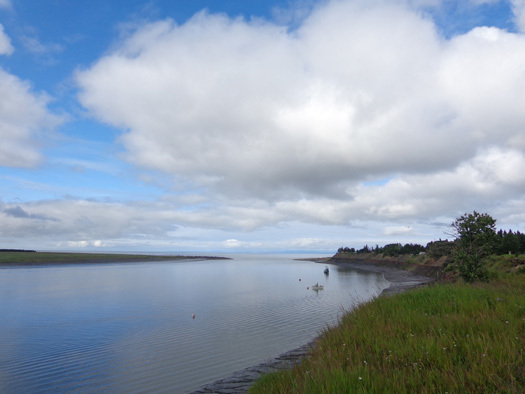 We drove back out Cannery Road and went across the Kenai River on the Bridge Access Road about a mile upstream from its mouth into Cook Inlet and observed a few fishermen on the bank. 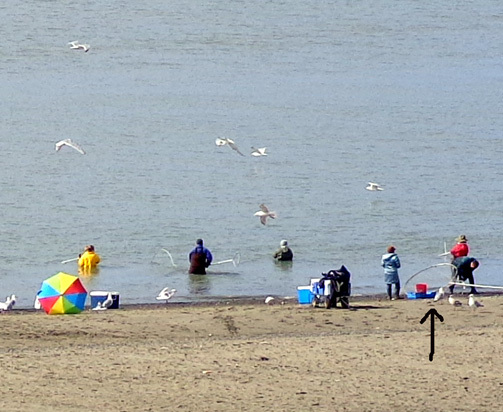 We couldn�t see all the action at the mouth of the river from there but we knew it was probably hopping with dipnet fisher folks on this sunny day. On the way to the bluff overlooking the estuary and river we saw pretty little Leif Hansen Memorial Park, which has some beautiful flowers planted by master gardeners. I got out to take some flower pictures, which I'll show you in the next entry. There is no privacy anywhere with today�s cameras and cell phones. Be careful! SO WHAT'S THIS "DIP-NETTING" THING?? Dipnet fishing is one of many new things we learned about salmon fishing. 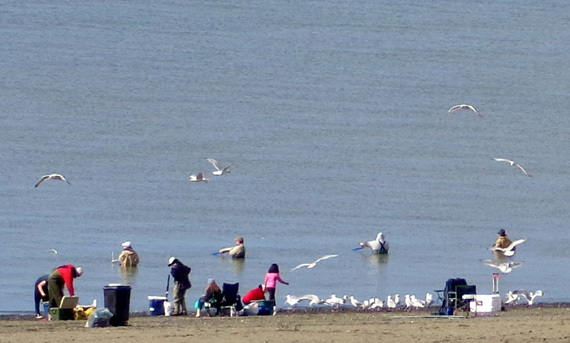 It's a practice reserved only for Alaska residents and the season lasts only two weeks in the middle of July at the mouth of the Kenai and Kasilof Rivers on Cook Inlet. Red (sockeye) salmon are caught in large round nets up to five feet in diameter, held by the fisherman or woman in waist-deep water near the shoreline. We saw dip nets for sale all over Soldotna and Kenai this week. I don't know all the rules but residents are limited to how many red salmon they can catch each day. I believe it's based on family size. This is only one type of Alaskan subsistence fishing. Despite rationing of various other types of salmon this summer, folks who catch their daily limits of sockeyes in the next two weeks should have enough salmon to eat for the next year. 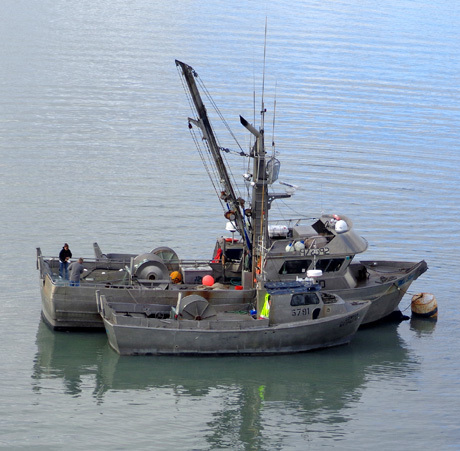 Note that non-state residents can still fish in various places on the Kenai Peninsula during dipnet season. They are also subject to limits and locations but are allowed to fish by other means than the use of dipnets. 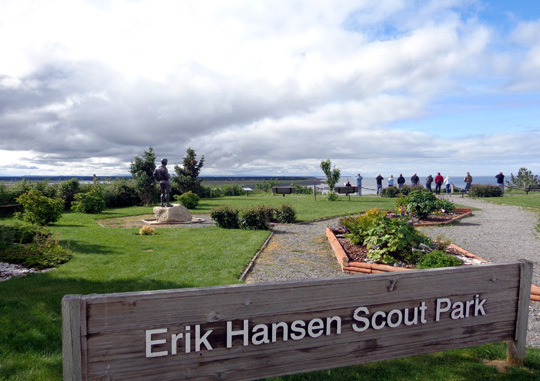 After we watched the commercial fishing boats we drove through the area with the old Russian church, rectory, and chapel again (more photos) and found an even smaller park (Erik Hanson Scout Park) with a great view, still on the bluff, overlooking the mouth of the Kenai River. Dipnetters use S. Spruce St. to access the beach. Porta potties were added to supplement the existing bathrooms. It appears that there are food concessions and a children's play area. Many folks set up tents for shade and a place to rest and/or keep their belongings. I don't know if they can camp there overnight. A fee is charged to park during dip net season (not sure about the rest of the summer) so we didn't drive down there. There were hundreds of gulls flying above the fishermen, hoping for scraps. It was interesting to watch the whole scene for a few minutes. We also went down N. Forest Dr. on the other side of Municipal Park. There is beach access from there on rough iron steps. 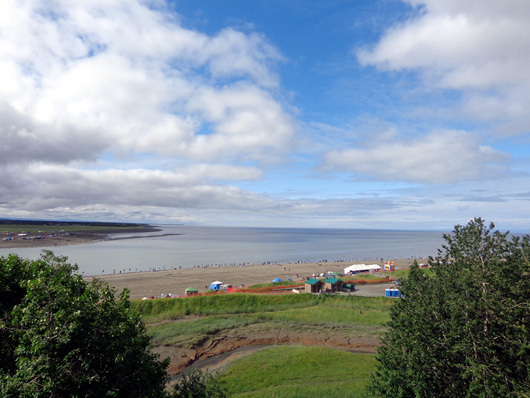 We weren�t interested in the frenzy below so we continued north on the Spur Hwy. to the end of the road at MP 40 in Captain Cook State Park, hoping to catch some good views of the volcanic mountains on the other side of Cook Inlet. 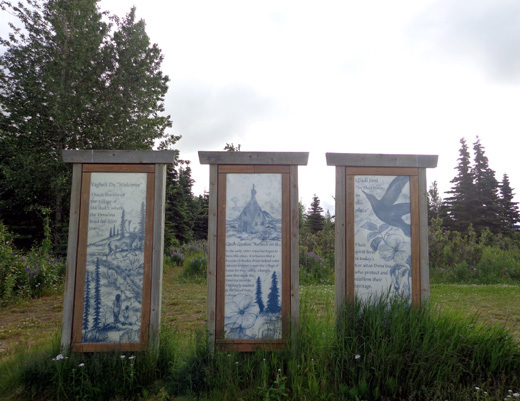 I'll talk about that in the next entry, as well as the gas and oil industry in the Nikiski area and a hike I took at the Kenai National Wildlife Refuge near Soldotna.